We all know every comic book geek in the world pissed their pants the moment they heard rumors about an actual Avengers Movie in the making. Now with everything confirmed and trailers have been popping up all over the web I guess it's time we see a couple of toys come out and try to grab all your geek cash. Hot Toys released a teaser image of their upcoming Avengers Cosbabies and for some reason I'm weirded out by one of the characters included in the line. 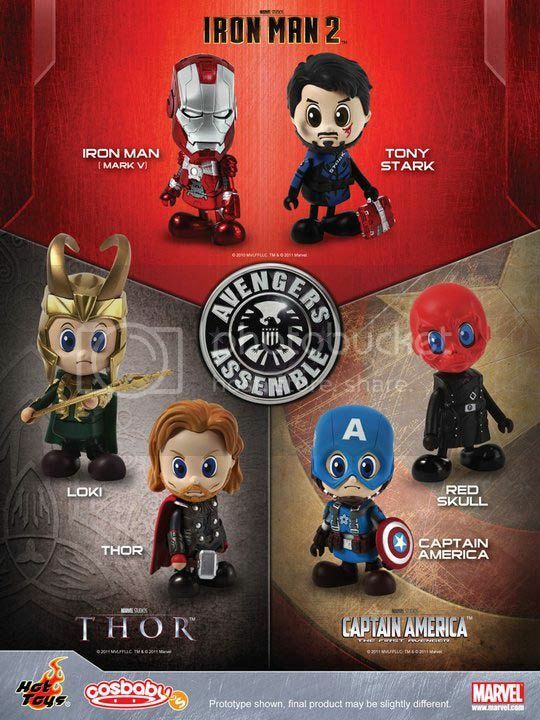 It may or may not be a spoiler but it's kind of weird that he's part of the "Avengers Cosbabies". Or maybe it's just me getting ahead of myself? Anyways you can see the whole teaser image after the break along with the questionable character in his cosbaby form.